For those that want to forge a clearer and more scientific path forward, Leading from Under the Sword of Damocles provides a practical guide that shows business leaders and risk management practitioners how mathematical emulation can be used to understand the impacts of hyper connectivity and hyper risk, as well as clearly identify when and which opportunistic actions should be taken to ensure the continuous efficiency and cost effectiveness of business operations. Globalization trends and the rapid pace of technological innovations have introduced unprecedented change and uncertainty. For unprepared businesses, the drivers of the Fourth Industrial Revolution will become a constant source of surprise and crises will unfold at an ever-increasing rate. To thrive under these conditions, companies must adopt new risk management technologies and practices that enable business leaders to better anticipate and adjust to changing dynamics. The methods presented in Leading from Under the Sword of Damocles have been proven through hundreds of client cases. By using mathematical emulation to link business risks to strategic imperatives, it becomes possible to achieve a higher annual profit margin and better growth. As we enter the Fourth Industrial Revolution, companies that are able to expose risks caused by dynamic complexity and maintain the alignment between the goals of the business and operational execution will be better prepared to make the shifts necessary for long-term success and keep the business moving toward its goals. Leading from Under the Sword of Damocles helps readers understand how algorithm-based predictive and prescriptive analytics principles can be used to control risk in today’s dynamic business environment. It serves as a reference guide for business leaders and risk management practitioners of companies that are global in reach or operate dynamically complex systems. Case studies show how the presented methods can be practically applied to preemptively expose risks and support decisions to optimize, transform or disrupt current business models, strategies, organizational structure and information systems when necessary to maintain a market position or outperform competitors. Using the technological and scientific innovations presented in this book, business leaders can gain a wider understanding of risk and prescriptively determine which actions are necessary to ensure the business is optimally positioned to meet its stated long-term goals and objectives. Dr. Nabil Abu el Ata is the co-founder of URM Group, and has invested over 20 years in maturing the science of risk management and the practical application of technologies to predictively expose and prescriptively treat operational risks caused by dynamic complexity. With over 15 patents and decades of experience providing consultative services to some of the world’s largest and most complex organizations, he offers a breadth of analytical skills, risk management and business intelligence expertise, as well as IT and business process management knowledge. Annie Drucbert is a co-founder of URM Group and a recognized authority in the predictive and prescriptive analysis of economic, financial and enterprise systems. Mrs. Drucbert’s specialties include modeling, emulation and performance management of complex database and corporate systems. Mrs. Drucbert holds 3 US patents and has delivered strategic, tactical and operational services using X-Act OBC Platform for several global clients. 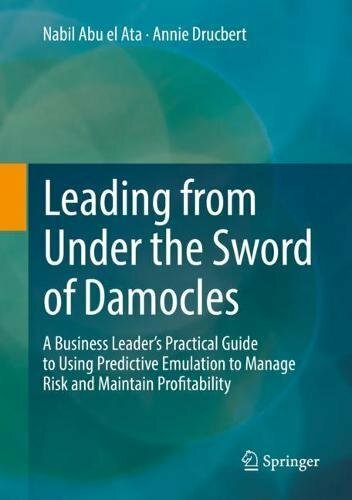 Leading from Under the Sword of Damocles: A Business Leader’s Practical Guide to Using Predictive Emulation to Manage Risk and Maintain Profitability is available in both print and e-book through online book sellers including Amazon.com and Springer.